Eighty percent of the Wikimedia Foundation projects are not doing well. They hardly grow both in size and in community and there is room for quality improvement. Given that all our projects are done by volunteers and given that we rely on growing our community in order to improve our projects usability is key. It has to be easy and inviting to collaborate. UNICEF hosts several MediaWiki wikis. They found that people have a problem contributing. They did usability studies in Tanzania and found that 100% of their test subjects were not able to create a new article. This is shocking. It helps explain why our projects have a problem. Usability and localisation are the key enablers for people to participate. As part of the Extensions Testing project, we are testing the UNICEF extensions. The CreatePage extension now works. The picture above shows the default look with the Monobook skin. The first thing we can do is include a link to "Create article" in the sidebar. 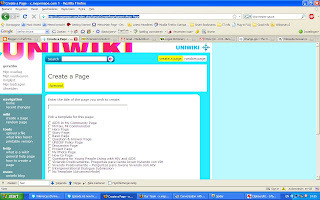 For the Uniwiki, a different skin has been developed and a "Create Page" button is given a lot of prominence. 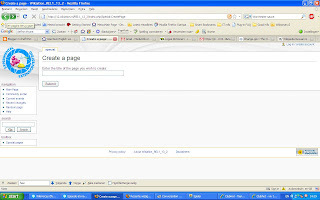 Another innovation is the idea of using templates for certain types of articles. This became feasible as a consequence of the "Create Page" functionality. It already makes sense for the WMF to implement this one extension as it is likely to make a big difference. Consider, 100% of the test subjects in Tanzania proved to be unable to collaborate so we desperately need to do better. 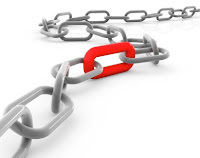 We can start by first implementing the core functionality; a link in the sidebar and a special page. As we gain experience, we can put more polish on it. We can work on visibility, we can create our own templates, we can work on the skin. We can make a start improving our usability. Given the state of the majority of our projects, it is easy to argue why. This extension would be great, especially for Wikibooks, where the naming convention for individual book modules isn’t obvious to newcomers. I didn't look at this in great detail, but seems awfully similiar to the inputbox extension which has been use for quite some time now (esp. at wikinews, but i think its used on other wmf wikis as while). There has been a create article box on the main page of [en] wikinews for a long time that gives customized instructions (different from just editing a red link) as while as a preloaded template for creating a page. We're using this on Appropedia - thanks to the patient help of the folks from UNICEF, helping us to install it, getting past clashes with other extensions, and ironing out the wrinkles. Have been meaning to blog, and recognize their work. Ultimately we need WYSIWYG (and FCKeditor is actually working well for people, and looking very tempting once it can handle tags better). If we do not have WYSIWYG (or something close to it) we do not have a wiki that's usable for most of the population. But Uniwiki is not just a stopgap. Even when we have WYSIWYG, there's elements of Uniwiki that we'll want to keep. The list of category tags on the right is much more intuitive for a newbie, and useful even for a wikiholic like me, as I can see what categories are already in use. Breaking the page up into sections would be good to keep as well, as an option toggled by a button. A long page with multiple sections is sometimes hard to get your head around in a small scrolling window. It makes it hard to reorder or add new sections, though, so it's important to have an obvious way to turn it off, but stay in an easy-to-edit WYSIWYG mode.